Jennifer Peryam | The Lima News Jane Rosengarten, Putnam County Optimist Club former president, speaks Tuesday to Ottawa Area Chamber of Commerce members about the club. OTTAWA — Ottawa Area Chamber of Commerce members learned Tuesday about the services Putnam County Optimist Club offers to children in the community. The chamber met for its monthly meeting at Julia’s Barn. Jane Rosengarten, Putnam County Optimist Club former president, informed attendees that the organization was chartered Sept. 3, 1991 and its focus is youth. Jessica Parker is the new president of the club and works at First National Bank. “Our mission is to provide hope and a positive vision and bring out the best in kids,” Rosengarten said. She said she became involved in the club because she liked the idea of helping youth and her children were all small at the time. There are currently 20 members in the organization that is countywide, and each club can choose their projects they would like to participate in. She said the Toys For Tots campaign in the largest project that helps needs children in the community to receive gifts. The club adheres to the rule that toys they purchase must be under $30. Optimists teams up with the Putnam County Community Thrift Store to help distribute the toys. The organization also has a Junior Optimist Club at Ottawa-Glandorf High School that helped prepare letters and sent out boxes in early November for toy collection. Collection started the second week of November and will end Dec. 11. In 2017, the Christmas for the Needy program that Optimists helps with put on by the thrift store served 1,458 people. There were 461 families who each received a food box and store certificates. “The Optimists focus on helping children that helps with their self-esteem, and the motto is ‘bringing out the best in kids,’” Rosengarten said. Other activities the club participates in are presenting Character Award Winners for grades 7 to 12 to outstanding youth who go above and beyond. The students are presented with gift certificates and a breakfast. An annual principal appreciation and breakfast and guidance counselor breakfast is provided by the club. The club meets the first three Wednesdays of each month at 7:30 a.m. in Henry’s front banquet room and is open to men and women who would like to join. 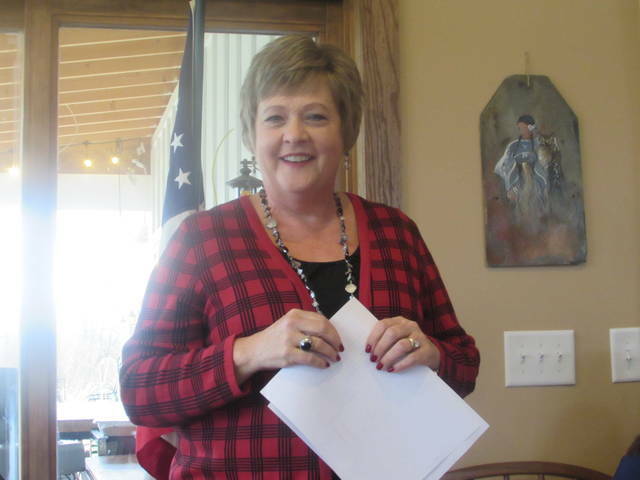 Cathy Burgei, chamber director, said the “Business of the Year” nomination forms are available on the chamber Webpage as well as the “4 under 40 nomination” forms. Small business Saturday winners were Amy Wehri and Kelly Spratt. https://www.limaohio.com/wp-content/uploads/sites/54/2018/12/web1_IMG_1772-3.jpgJennifer Peryam | The Lima News Jane Rosengarten, Putnam County Optimist Club former president, speaks Tuesday to Ottawa Area Chamber of Commerce members about the club.